Heroism in face of terror: An Israeli diplomat's wife wounded in Monday's blast in New Delhi apparently spotted the terrorist moments before the attack, managed to get out of her car, and evacuated herself to hospital despite her injury. Tal Yehoshua Koren, the wife of an Israeli Defense Ministry representative to India, was taken to hospital by rickshaw where she is in mild to moderate condition following surgery. She suffered shrapnel wounds after a terrorist attached an explosive device to the car she was traveling in, wounding four people. "According to information we received…a terrorist arrived on a motorcycle and attached something to the vehicle. She grasped the situation, showed resourcefulness, managed to get out of the car and evacuated herself to the hospital despite her injury," said her brother, Ido Koren. "Everything happened within seconds." "She possesses amazing level-headedness; not everyone would have conducted themselves this way," he said. "The motorcyclist managed to get away, but the most important thing is for Tal to feel better, and we're praying for it." The wounded Israeli's brother said Yehoshua-Koren suffered shrapnel wounds to her back, but added that the fragments were removed from her body successfully. Currently she is still anesthetized and is supposed to wake up within 48 hours, at which point doctors will determine the next steps, relatives said, adding that she may be flown to Israel at that point. "After seeing the vehicle, all of us realize it was a miracle," her brother said. Meanwhile, more details of the India attack have come to light. 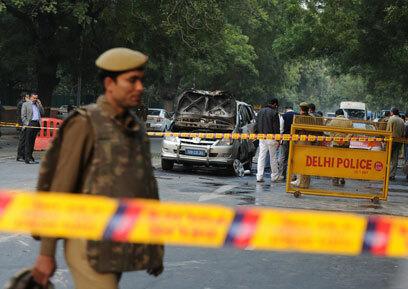 A magnetic device was attached to the Israeli Embassy car, which exploded a few seconds later with Yehoshua Koren in it, said Delhi Police Commissioner BK Gupata in an interview with The Times of India on Monday. Gupta quoted an eyewitness who told the police he saw a person riding a motorcycle attach a magnetic device to the rear end of the diplomatic car Yehoshua Koren was riding in on her way to pick up her children from school. The vehicle continued to travel for a short distance, and then a blast occurred and the car caught fire. "It was some kind of a magnetic device which was used to target the car," said Gupta. It appears that a remote control may have been used to set off the device and not a timer, said police sources. The attack did not appear to be the work of a local gang, the police said. See all talkbacks "Israeli hero: Envoy's wife spotted terrorist"